Here is my latest, a Hill Giant. So this is my next model in line to paint up. I'm hoping that this will give me some practice painting skin and faces, even though it's at a larger scale than a human sized figure. This is also my first bones model that I've started painting. Cleaned mold lines, assembled everything, pinned it to the base and green stuffed the gaps. Primed the base and green stuff and then I used brown line for my first coat on everything. Other than that I threw on a thinned down coat of cadmium skin. It will need a few more coats to cover the brown liner. I decided to get started on this while something else was drying. This one will probably move slowly as I will use him to fill time while I paint a couple of other figures. Thabks for looking! He was fun to paint. Can't wait for Bones 3 when my giant count will double. Recently got painted what may've been my favorite mini from Bones 2, the adaptation of Tre Manor's Krug, Hill Giant Chiefton. Great model, my first giant, and a fun one to paint, turned out. Just tried to keep it pretty simple, I guess. Tried for white wood with the club, in my ongoing quest to get wood right/not awful. Thought the goldish metal went well on it, too. I'm always silver. Wanted a wasteland-stones-something kind of something I don't know with the base. Thanks for looking! 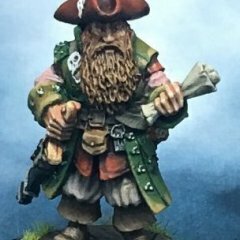 In a different thread Vince put out a call for terrain assistance the night before ReaperCon. He needed a big hill. (A table was planned that called for a graveyard on a hill.) A link to that thread. I saw the thread and a few PMs and text messages later it was determined that there was a hill hiding in my rather disheveled workshop room that might do. It looked like this: It was an unfinished slab of pink foam (the top had a basecoat on it). This shot was originally sent via phones to [give] Vince an idea of how big it was. That is a Storm Giant from the KS 1 batch along with a paint bottle for scale (I lack a copy of Sir Forscale). Hi Dibbler...Here are my basic, simple and generic fantasy terrain pieces. On these, I do nothing fancy or no real detail work...We play on a 4x8 table top board that is dark forest green in color...the terrain pieces are placed as designed for the given adventure and/or encounter...everything between the pieces is considered flat green meadow type terrain with no cover & 100% clear (LOS) visibility...Pictured are; 1. Solo shot of ruined building...(I have 5 such boards with varied ruined aspects)... 2. Shot of 4 ruined buildings together to form a sort of ruins complex... 3. Shot of generic terrain pieces of varied sizes & shapes...(I have 30 such pieces and another 12 that are total foliage covered)... 4. Shot of 1 of my generic hills...(this is Fire Hill = View #1)...(I have 6 such hill pieces)... 5. Shot of (Fire Hill = View #2)... So as I said...I do detailed work on projects that deal with my home shire/town...but the rest is basic non-detail generic material and fantasy terrain pieces. This is a tabletop playing piece for my RPG adventure group. It was scratchbuilt out of ceiling tile...the piece is 18" x 10"...the double green fir tree ridge is 7" tall as is the double yellow tree ridge...the dead man ridge is 4" tall...the gully running in the middle is 2" tall. All rocks & rock slabs were cast by me out of plaster. It makes a nice central piece on a wilderness table...the lone dead man offers the chance to find a few gold coins and/or a potion or two (if he hasn't been cleaned out by the time the adventure group finds him).